A week ago I shared some posts related to replication and scheduled jobs information and you may enjoy it. Hope you liked it too. While working with security, suddenly I started to receive an error when sending an email though script using sp_send_dbmail from msdb database specifically for one user and I clicked it was due to changes in access of that user. The analysis was going long and checked user access to msdb databases and it has db_datareader, and DatabaseMailUserRole and failed to send an email. Even it was not working, assigned db_owner to that user in msdb database. YYou can also make the same changes from the user interface. 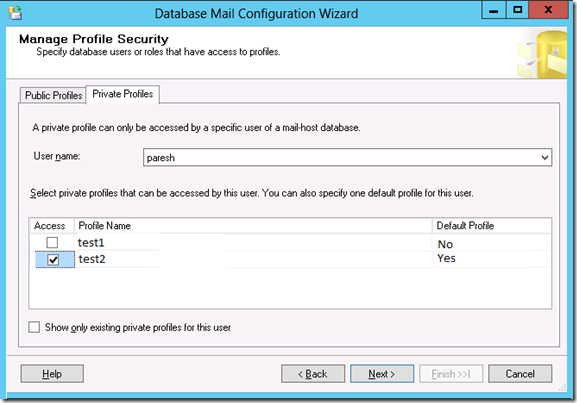 Goto Database Mail, right click and goto Configure Database Mail , select an option Manage Profile Security, Go to Private Profiles Tab, Select User name and check the box of Access and make a default profile to Yes for the profile name using which we want to send an email. After above change it was succeeded to send an email. Stay tuned for more.